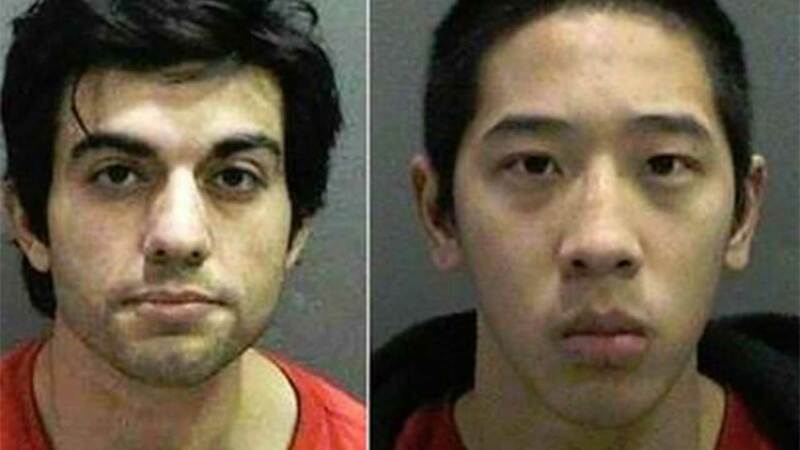 SANTA ANA, Calif. -- Orange County sheriff's officials said two escaped inmates are believed in the San Jose area, and could possibly heading for the Fresno area. Capt. Jeff Hallock said it's believed 20-year-old Jonathan Tieu and 37-year-old Hossein Nayeri may have headed to San Jose because of the large Vietnamese population. Nayeri is said to have family or an associate in Fresno, leading the sheriff's department to believe the two men could head that way. Bac Duong, one of three inmates who escaped from Orange County Central Men's Jail, was taken into custody on Friday. Orange County Sheriff Sandra Hutchens said Duong, 43, flagged down a civilian on the streets of Santa Ana around 11:40 a.m. and stated that he wanted to turn himself in. Officials said the search continues for a white van that Tieu and Nayeri may be living and traveling in. Hossein Nayeri, 37 (L), Jonathan Tieu, 20 (C), and Bac Duong, 43 (R), are shown in undated mugshots provided by the Orange County Sheriff's Department. Duong, Tieu and Nayeri broke out of the Santa Ana jail last Friday using an elaborate plan that involved cutting through steel bars and plumbing tunnels and rappelling down the jail's roof using folded up bed sheets. Eyewitness News got an exclusive look at the planned escape route taken by three inmates who broke out from the Orange County Central Men's Jail. Authorities said Duong was last spotted on Saturday in the south end of Los Angeles and stole a 2008 white GMC Savana utility car that was for sale. A private owner advertised the vehicle and Duong had responded to it, authorities said. He test drove the van, came back and at some point took off with it, said Hallock. The license plate on the van is 8U66466, but Hallock said the plates may have been removed and replaced with yellow or green Felix Chevrolet paper plates. Two searches were conducted Thursday night in Westminster in connection to the manhunt - one was at a residence and the other was at a warehouse. Multiple people were detained and released, but no arrests were made. Also Thursday, authorities arrested 44-year-old Nooshafarin Ravaghi of Lake Forest. Ravaghi was booked at the sheriff's department on suspicion of being an accessory to a felony. Her arraignment was scheduled for Monday. 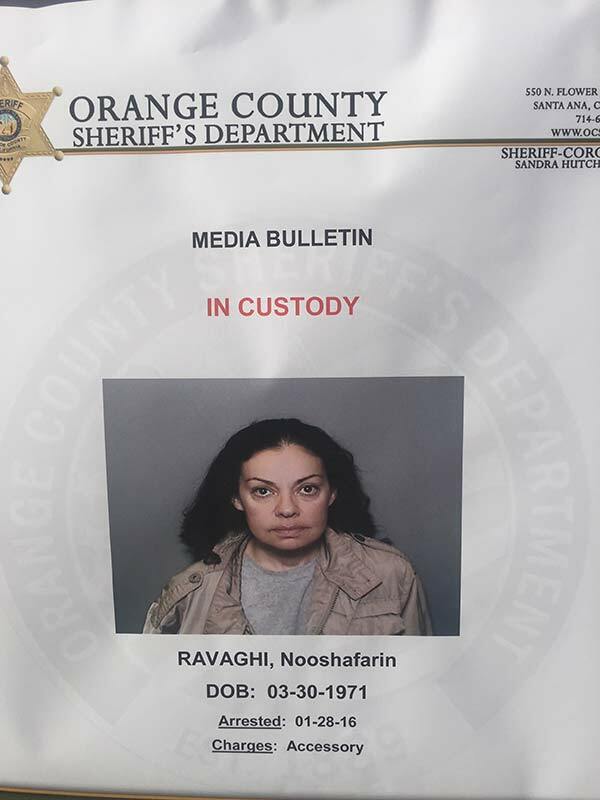 The Orange County Sheriff's Department released the booking photo of Nooshafarin Ravaghi, who was arrested on suspicion of helping inmates escape from the O.C. Central Men's Jail. Duong had been in custody without bail since December 2015. He faces charges for attempted murder, an ex-felon in possession of a firearm, possession of a firearm, possession of stolen property, car theft, assault with a deadly weapon and shooting into an inhabited home. Anyone with information on the other inmates' whereabouts was urged to call the Orange County Sheriff's Department hotline at (714) 628-7085. Those wishing to remain anonymous may call Orange County Crime Stoppers at (855) 847-6227. 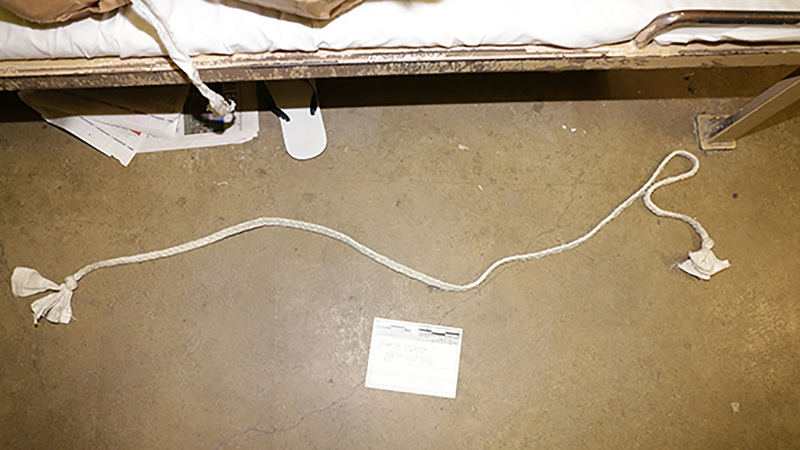 The Orange County Sheriff's Department released photos Sunday, Jan. 24, 2015 from their investigation into a brazen escape at the Orange County Central Men's Jail in Santa Ana.